Motorola updated its popular Moto G Series with four devices, all of which claim to have their own unique selling point. What else does the Moto G7 Play offer though? Here are our first impressions of the bottom of the Moto G pack - the £150 Moto G7 Play. 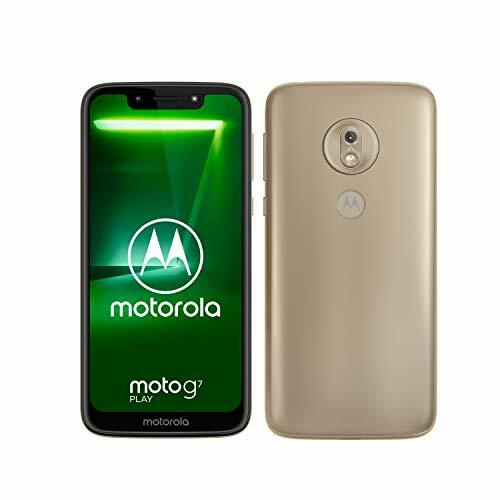 The Motorola Moto G7 Play is the cheapest looking device within the Moto G7 family. While the standard G7 and the G7 Plus both offer very premium finishes for their price points, the Moto G7 Play opts for plastic over glass on the rear. Despite not offering as premium a finish as its siblings though, the G7 Play does still come with a couple of premium features including USB Type-C, microSD and a 3.5mm headphone jack. It follows the same design path as the G7 Power, G7 and G7 Plus too. There is a circular housing in the centre of the rear with the single rear camera, while the signature Moto "M" sits below it, now offering a fingerprint sensor. A notched display rather than a tear-drop display like the standard G7 and G7 Plus is present for the G7 Play. The notch means you get more display within the footprint than the G6 Play offered, but the tear-drop is certainly cleaner looking. The bezels at the edge of the display are also more prominent than its more expensive siblings, which makes for an overall cheaper look. Let's not forget the Moto G7 Play is £150 though and for that money, you get a lot of phone and a lot of screen. The Motorola Moto G7 Play has a 5.7-inch display, making it the smallest of the Moto G7 series but that's still a pretty big display within a very manageable footprint. The Nokia 3.1 is the same price but you get a 0.5-inch smaller screen with that handset. The 5.7-inch screen has a HD+ resolution, which means things aren't as crisp as the Moto G7 and Moto G7 Plus. Then again, the Moto G7 Play is £100 cheaper than those models and it's not immediately noticeable. Colours appear to be punchy and vibrant and the Moto G7 Play also appears to deliver ample brightness, though we will need to test this in full when we come to review it. The Motorola Moto G7 Play comes with a single rear camera like the Moto G7 Power. It doesn't have any of the fancy features offered on the higher end Moto G7 devices so you won't get optical image stabilisation and the Auto Capture and Smart Composition features aren't available either. The Moto G7 Play is still able to offer portrait mode though, despite not having that second depth sensor on the rear, like the Moto G7 and Moto G7 Plus. Motorola relies on software to offer the popular blurred background images, and the selfie camera is capable of portrait mode too. On the front, you'll find an 8-megapixel camera and there's a selfie flash on board too. We'll need to test the Moto G7 Play in full to give our verdict on the camera but while it isn't likely to deliver the results of the Moto G7 Plus, this device is quite a bit cheaper so expectations would be lower. One of the positives about the Moto G7 Play is that you get the same core hardware as the Moto G7 and the Moto G7 power. Sitting on Snapdragon 632, the difference here is a drop down to 2GB RAM and 32GB of storage, but there is support for microSD for expansion. While the RAM drops, you're still getting pretty good mid-range hardware, where some devices at this price point wouldn't give you Qualcomm hardware. The battery capacity is also the same as the other G7 family (except the battery monster the G7 Power) and there's USB Type-C on the bottom. There's only a 5W charger, however, so you don't get the same fast charging that you do from the other models out of the box. We've not spent enough time with the Moto G7 Play to really gauge its performance. Positioned as it is, there's going to be some drop off in the experience compared to those devices positioned slightly higher - but then you're getting this phone for not a lot of money. The hardware goes hand-in-hand with the software and here you're getting the same clean Android experience that Moto has been offering for years. It's running on the latest version of Google's software - Android 9 Pie - and Moto doesn't pre-install bloatware. The only real additions are support for a couple of Motorola features, giving you a few more gesture and display options. From our brief time with the Moto G7 Play we haven't really had the chance to fully determine what the shortcomings will be at this level. We'll be giving it a more intensive test and seeing what this budget phone has to offer in the near future. It doesn't deliver the premium finishes you'll find on the G7 and G7 Plus, nor the battery capacity of the G7 Power, but it offers the same chipset as the G7, it runs on Android Pie and it has a large screen in a slim form factor. If value for money is a concern, you can never discount the Moto G - and the Moto G Play is the cheapest of the lot. We will, naturally, be bringing you a fuller breakdown of the experience, as soon as we can.